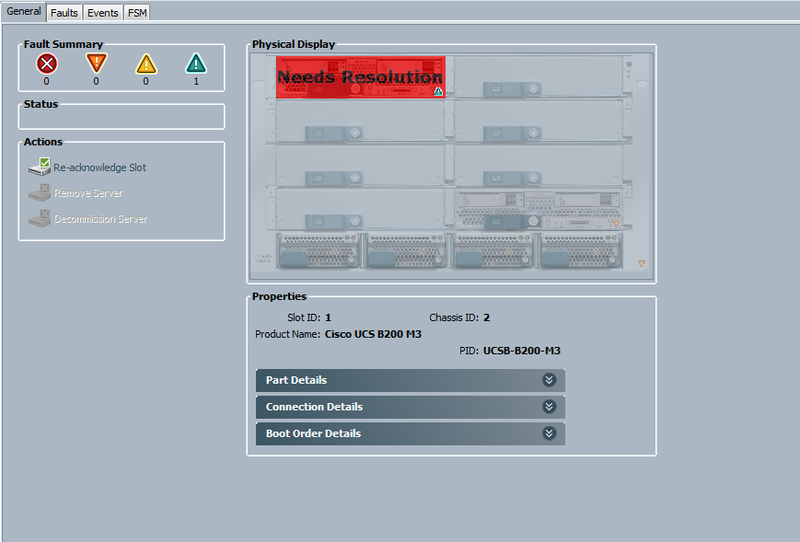 During a recent UCS firmware upgrade I had quite a few blades show up with the error “CIMC did not detect storage”. Within UCSM I could see that the blade had a critical alert. It initially started after I upgraded UCS Manager firmware as documents in a previous post I wrote about UCS Firmware Upgrades. I did some searching around to find what may be causing the issue and the best answer I could find was to from the Cisco community forums to disassociate the blade, decommission and reseat within the chassis. I later spoke to a Cisco engineer and he advised of the same steps but that it was also possible to do without reseating the blade. This also looks like its a problem when upgrading from 2.2(1d) to other versions of UCSM but I haven’t been able to validate if it’s only that version or if it also affects others.